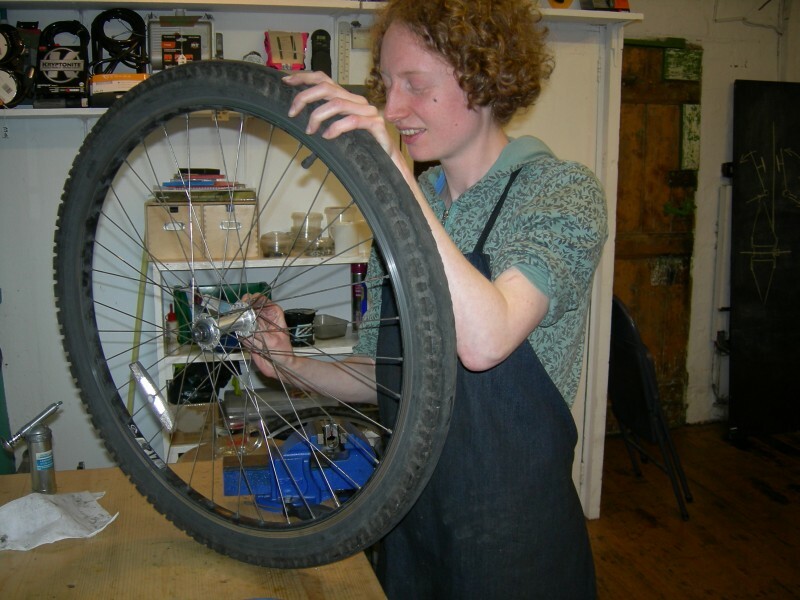 Freewheelers Bicycle Workshop – A co-op run by women! We opened Freewheelers Bicycle Workshop back in October 2011. Our project is run by women and our aim is to be a friendly, approachable, not intimidating bike space for the community. We run a tool club where people can come once a week (Wednesday evenings) and use our workshop, tools, books and get support from us to repair their own bicycles. The tool club is run on a voluntary basis and so members only have to pay only £10/£15 to become members for a year. We’re also a workers co-operative hoping to raise enough money to give a decent wage to the three of us. 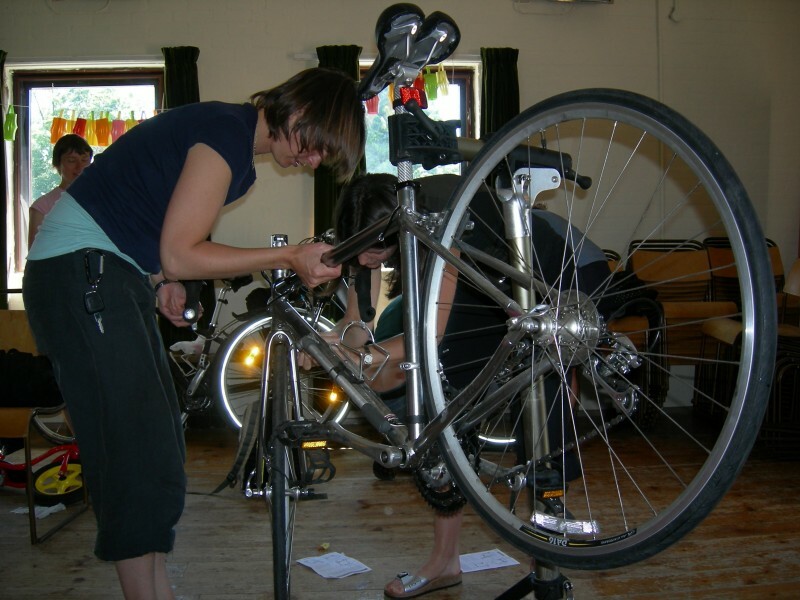 To that end we run a repairs service, sell parts and accessories, deliver maintenance workshops, offer Dr. Bike services and soon will offer Bikeability – with a focus on empowering adult women to feel confident and assertive on the roads. We run women-only maintenance courses and tool club sessions for all those who identify as women. We find that cycling is often a very male dominated activity, not only in numbers (more men than women cycle), but also in attitudes. Too often it seems you have to be aggressive, over assertive and over confident to ride your bike. We find that this affects both women and men and whilst offering women-only specific activities, we hope to be friendly and approachable so that men that don’t conform to the male cyclist stereotype, and that may not have experience with mechanics or might also feel unconfident welcomed in our space. So far our experience has been very positive. We’ve had more and more people interested in our space and even though numbers are not quite adding up yet to pay ourselves a salary, we feel we’re on the right track! The best bits are the interaction with people, seeing how excited people get when they start seeing the bicycle as being made of different parts and how you can learn to take care of it. Even discovering how hard tyres inflated to the right pressure are supposed to be makes people feel so excited about their machines and makes them engage and love them in a different level. For us feminism is deeply needed in the cycling world to make cycling inclusive, approachable and available to all. We believe cycling is not intrinsically feminist or sustainable and so we feel we need to create and facilitate a truly feminist, inclusive and sustainable cycling culture. For that we need to reflect on the attitudes surrounding cycling – like we said above – and on the cycling industry and how and where our machines and the parts that make them run are produced. We’re committed to make people think of their bicycles as valuable objects that are worth repairing and maintaining and that can last for a life time if we invest in them. This is a reflection we need to make to many customers. Often people ride their bikes for years and years until they are completely knackered. Then, bringing them up to scratch can be slightly expensive and they think they’re better off buying a new bike. Explaining that if you maintained your bicycle regularly you may spend no more than £30/£50 a year, often makes them see that keeping a good frame and investing (time and/or money) on it is worth it. We’d like to see the British cycling industry alive and kicking again, not only to make the production of bicycles and bicycle parts more local and sustainable but also because that could create much needed local and useful jobs. That’s why we’re committed to try to stock British made and ecologically sound products – such as Carradice panniers or Green Oil. However, the processes of production and distribution are in the hands of big companies that have a lot of power and make it difficult to access the products we’d like to purchase or that we’d like to see produced. But, whenever possible, we’re committed to work with smaller companies that are more local and work at a more human scale. We dream of a co-operative of bike projects and co-operatives strong enough to work towards that change. For that, we just need to hang on in there and try to spread our ideas and hope that the local cyclists and cyclists to be trust us and come to us.